Medical IDs are worn by many people with medical conditions such as diabetes, epilepsy, autism, and food allergies. The intention is to alert first responders of their chronic illness, allergies, or medications even if they are not conscious enough, old enough, or too injured to explain. According to EMS World, even in its simplest form, a medical alert bracelet can be a powerful lifesaving device. Information found on medical IDs can help prevent EMS and emergency personnel from administering the wrong treatment when the wearer can’t speak for themselves. More than 95% of First Responders surveyed by American Medical ID look for a medical alert bracelet or necklace during emergencies. The primary benefit for someone wearing a medical ID is the safety and peace of mind it offers in times of vulnerability. This form of emergency jewelry helps reduce medical errors, avoid unnecessary hospital admissions and can prevent minor emergencies from increasing in severity. With health care costs currently escalating year over year in America, these are secondary, but highly useful benefits. Just last month, novelty medical IDs that have funny engraving such as “delete my browser history” have made their way back onto social media. According to a website who sells this type of bracelet, these “gag” medical IDs are intended to be a funny gift or present to anyone who spends a good amount of time on their computer. These novelty medical IDs look like a regular medical ID that responders look for, and in fact, it is hard to tell the difference until you read the engraving. The front of the ID features the same red medical emblem that sets medical alert jewelry apart from ordinary ones. People who wear genuine medical IDs rely on this emblem to alert responders in a real emergency. 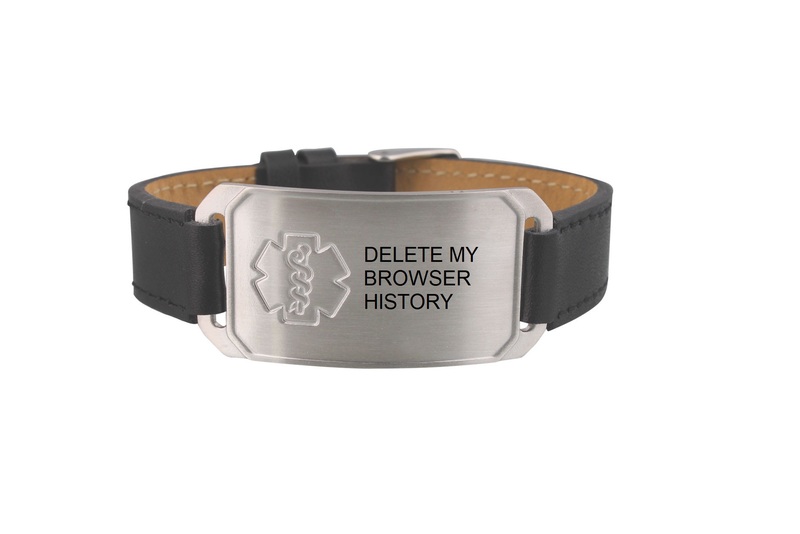 Funny texts like “delete my browser history” or expletives are also engraved in the same manner as that of a real medical ID. Ultimately, these fake medical IDs are not as funny as some may think. They can easily cause unnecessary distraction and delay for First Responders who are trying to save lives. “Wearing a joke or novelty medic alert bracelet in your everyday life is not funny, it is stupid and causes grief to the people who are trying to save you”, says a netizen who works in the healthcare and emergency medicine. While people cannot be stopped from ordering medical IDs with funny engraving, customers should be aware that in an emergency, their fake medical IDs can set them up for trouble. “We hope that those companies who choose to offer these gag IDs for sale re-think and consider the harm that they are doing to the legitimate and practical use of these products in genuine emergencies” concluded Rick Russell. If you have a medical condition and must be really wearing medical alert jewelry, here are tips on the right things to engrave on your medical ID. awareness, funny medical alert bracelets, medical emergency, medical ID, medical ID bracelet, medical ID jewelry. Bookmark.